Despite only ever two minutes of league action and 3 cup appearances there, right back Alfei remains a Swansea player but is in the final months of his current contract and surely he will be leaving for pastures new before long. Over forty League Two and Conference Premier appearances in loan spells at Wrexham, Portsmouth, Northampton and presently at Mansfield Town suggest those pastures will be in the lower reaches of the football league. Alfei was man of the match on his Swansea debut in the FA Cup against Colchester and was highly regarded at Portsmouth during his loan spell there. 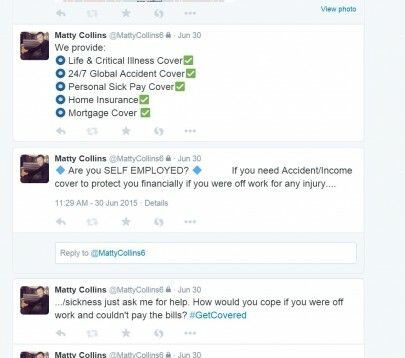 A season-long loan at Northampton however was cut short after only six months in January 2015 and he didn’t play first team football in over a year. Almost 40 appearances at under 17,19 and 21 level suggests Alfei is as well-schooled in the ‘Welsh way’, as he is in the ‘Swans way‘. In and around the Swansea first team squad at the start of the 2013-14 season, helped by Jazz Richards being loaned out to Huddersfield, Alfei was called-up as cover for the double header against Macedonia (h) and Belgium (a). James Wilson and Richards were also defensive call-ups after a raft of withdrawals. Richards made his full debut, and Wilson was a 578th minute substitute for the injured James Collins; Alfei, however, remained on the bench. With Championship-level strength in depth at right back (Chris Gunter, Richards, Adam Henley, Rhoys Wiggins) Alfei is unlikely to receive further call-ups if the only level at which he plays remains League Two or below. London-born Wiggins was a regular at under 21 level under Brian Flynn and was part of the crop who pushed England close in the two-legged play-offs in 2009, although Wiggins was among the elders of that group. Wiggins’ Wikipedia page claims that his first call-up to the national squad came during Brian Flynn’s caretaker stint. However he was actually an unused substitute, indeed the only one not to take to the field, in the 2006 friendly against Trinidad and Tobago in which Gareth Bale, Jason Brown, Arron Davies and Glyn Garner made their international debuts; for the latter pair it is the only cap they went on to win. Having won 17 caps at under 17, 19 and 21 levels and been a regular at Championship level recently it is perhaps surprising that nine years later he is yet to make his senior bow. But it is also testament to the strength in depth at full back at present and Coleman’s preference for wing backs on occasions. 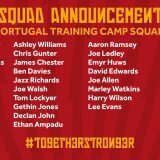 Having been on standby for numerous squads, Wiggins remains on the periphery of Coleman’s thinking though, as proved by his inclusion in the squad for the 2013 friendly versus Finland and the 2014 double header against Cyprus and Bosnia. Currently at Wrexham, Cardiff-born Fowler has signed, either on loan or permanently, for a remarkable 18 clubs…and is still only 32. 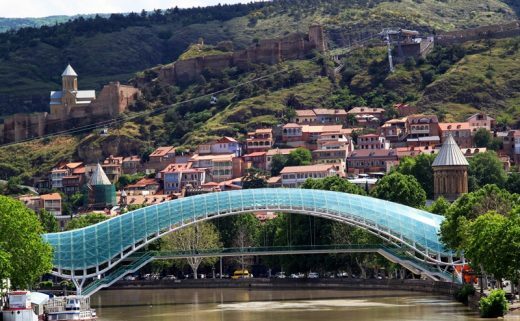 Having also been treated for alcoholism, playing for Conference North side Tamworth in the qualifying rounds of the FA Trophy, as he did on loan earlier this season, is a far cry from his call-up to face Argentina in the prestigious 2002 friendly. Fowler was only 18 and had broken into Coventry City’s first team as they adjusted to the Championship following relegation the previous season. Fowler was initially a striker and won under 17 and 19 caps for Wales before his surprise elevation to the full squad. A dozen under 21 caps then followed and he eventually settled into midfield but he slid down the divisions. Despite scoring the winning shootout penalty to seal Huddersfield’s promotion to League One in 2004, and a season at Burton Albion, much of Fowler’s career has been spent flitting between the Conference Premier, its North and South feeders and The Welsh Premier League (briefly at The New Saints and Cefn Druids). But Fowler also had two surprise stints in League One when he twice signed for Dean Saunders: in 2013 for Doncaster and 2015 for Crawley. On signing for the latter and making a goal-scoring debut, Saunders believed, despite having “wasted his talent”, that Fowler was “more talented than anybody in [the] league”. Swansea-born Beer started out in local Swansea leagues before being picked up by the Swans in 1971. 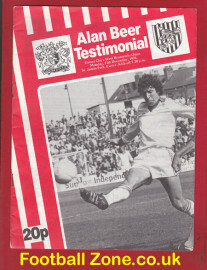 Despite a promising start to his professional career he slipped into the Southern League with Weymouth, where he won amateur caps and a man of the match award in a 3-0 win against Scotland, but was soon noticed by Exeter City where he formed a prolific strike partnership with Tony Kellow that helped fire the Grecians to promotion from Division Four in 1977. That season’s form was rewarded with a call-up to the Wales XI squad that Mike Smith assembled to play Wrexham in honour of Mickey Evans’ testimonial in May 1977. He started life in Division Three well and with the likes of Leicester City interested in signing him, Beer was selected in the initial squad for the Kuwait home and away friendlies in September 1977. However in a match at Shrewsbury Town the preceding weekend Beer seriously damaged knee ligaments preventing him from joining the squad. If that was not disappointing enough, the injury also sadly brought a premature end to Beer’s career and he was subsequently awarded a testimonial by the club. Had he represented Wales he would have been only Exeter’s second ever international at the time. Thanks to @mirkobolesan for commenting on the first ‘Called up but not called upon’ and suggesting ex-Barry Town, Cardiff City and Newport County goalkeeper Pat Mountain once received a call-up. Diolch yn fawr to @Machludwr for drawing to my attention Grimsby Town’s Frederick “Jack” Lewis. Derbyshire-born Lewis was selected in the squad for the decisive final Euro 76 qualifier at Wrexham against Austria in 1975. John Toshack was suspended and speculation was rife that Mike Smith was going to give Lewis, whose father hailed from Llanhilleth in the Ebbw valley, his debut. But handing first caps to goalkeeper Brian Lloyd and defenders Ian Evans and Joey Jones, Smith probably considered that to be enough debutants. Instead he packed the midfield and selected David Smallman, in his first season at Everton after a transfer from Wrexham, as the lone striker. Smith was vindicated as Arfon Griffiths scored the winner which saw Wales reach the quarter finals of Euro 76. According to the Cod Almighty Grimsby Town forum, the “Zapata moustached” Lewis was warming up ready to come on when Griffiths pounced. Smith chose not to make the intended substitution, indeed any substitution at all, and that was as tantalisingly close as Lewis came to a full Wales cap, though he did represent Wales as an overage player in a 1976 under 23 international against Scotland and as a squad member was photographed in the classic Admiral kit of the time. Tenby native Brace unluckily contracted pneumonia upon his only international call-up in 1996 ahead of the home qualifying defeat to The Netherlands. 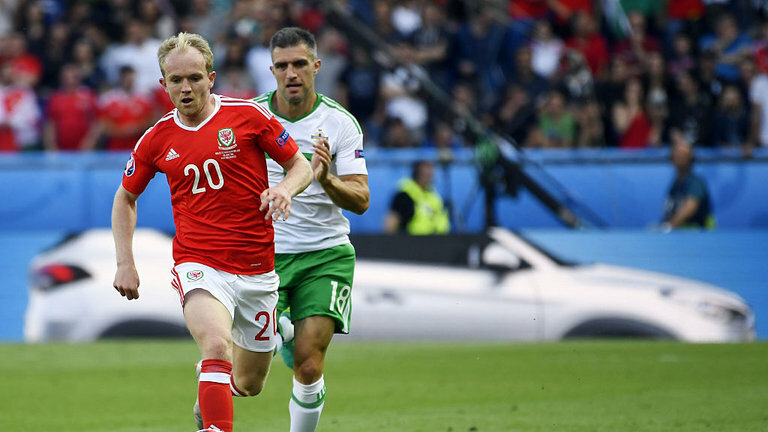 He recovered to further represent Wales at under 21 level but never received another call-up, though he did play against Wales for Wrexham in the match to mark the club’s 125th anniversary. Released in 2000 Brace later returned to his west Wales roots representing Llanelli, Carmarthen and Haverfordwest, managing the latter pair. 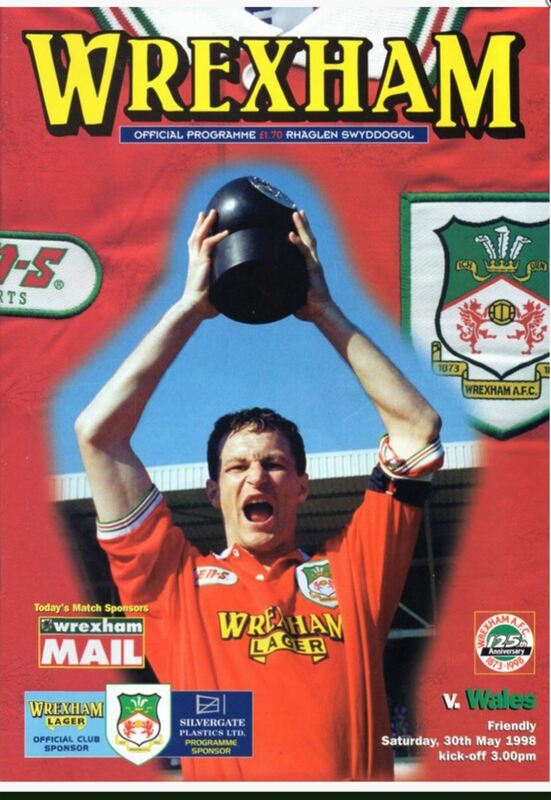 The elder of the Wrexham-raised footballing brothers, Jim and Jeff, Whitley was one of three uncapped players called-up by Bobby Gould for the 1998 summer tour to Malta and Tunisia (Chris Llewellyn and Ryan Green were the others). Jeff had already made his international debut for Northern Ireland, the land of their father, and Jim was a squad member. But, like David Johnson below, it is unclear whether the terms of the home nations agreement would have allowed Whiteley to represent Wales, despite his status as a British passport holder born outside of the UK (in Zambia), due to his father being born in the UK . It mattered little since within 24 hours of the call-up Whitley opted to remain part of the NI set-up and made his debut against Spain the following month, winning a further two caps and a B cap. 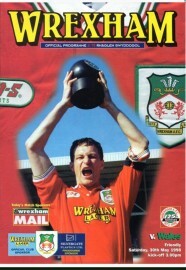 Whitley went on to play over 150 times for Wrexham. According to Wikipedia he is now a singer. Swansea-born Gwyther was a useful striker in the lower leagues for Swansea, Halifax, Rotherham and Newport County averaging a goal every four games in his 18 year professional career which charted in 1965. Gwyther played in the latter’s famous 1981 European Cup Winners’ Cup run. Gwyther had represented Wales at under 23 level when he was selected for the FAW’s uncapped tour of Tahiti, Australia, New Zealand and Malaysia in 1971. The under-strength squad contained only three full caps: one cap wonders Wayne Jones and Ray Mielczarek, and tour captain Arfon Griffiths who only had a single substitute appearance to his name at the time. Several players went on to win full caps, but despite a couple of call ups Gwyther was not one of them. He started each of the nine tour games and finished top scorer with five goals including a brace versus Otago in Dunedin. Pugh was selected for Wales’s first ever overseas tour to Canada in 1929. The young wing half was selected by virtue of playing for Newport County at the time but was not actually eligible to officially represent Wales due to being born several miles over the border in Gloucestershire. There was no match against a national Canada team; instead the tour comprised 16 games against club, provincial and combined teams playing as the ‘Welsh FA’. Wales won each game. Every member of the touring party – which included illustrious names such as Johnny Neale, Fred Keenor and Billy Jennings – went on to win full Wales caps except Pugh and Tommy Lewis. Pugh played in only four of the matches, one of which saw Wales end with only ten players after Moses Russell “was assaulted by spectators”. So rather like David Johnson 70 years later Pugh holds the distinction of being called up by Wales even though he was not eligible. In the late 1990s and early 2000s Jamaica-born Johnson embarked on a surreal tour of FAs on a quest for a cap. After being an unused substitute for England under 21s in 1997 he decided to throw his lot in with Jamaica, for whom there was the added incentive of France 1998 round the corner. Before he represented the Reggae Boyz however he made a brief nine minute England B appearance in 1998. The following year he finally represented the country of his birth and made four substitute appearances, scoring against Paraguay and the United States. The friendly status of these games did not tie Johnson to Jamaica and in 2000 ahead of a dead rubber qualifier against Switzerland at the Racecourse Mark Hughes selected his ex-Manchester United teammate despite interest from Northern Ireland. The belief was that as a British passport holder born outside the UK Johnson was eligible for each of the home nations. 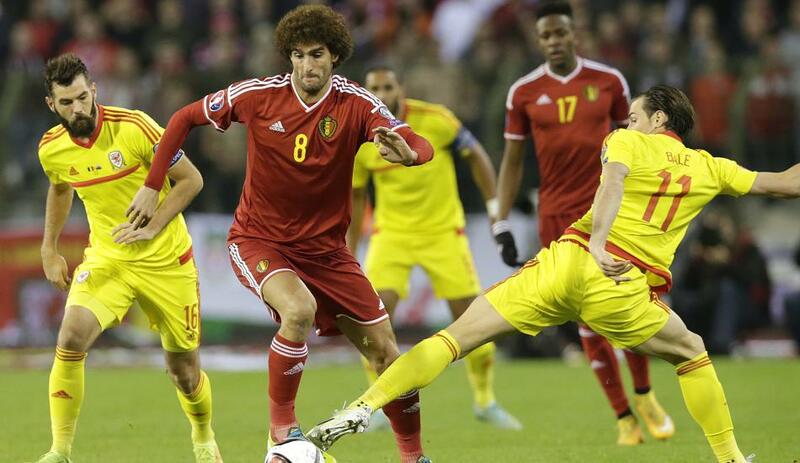 An ankle injury ruled Johnson out but before a second Wales call-up could be made. Johnson was now interested in playing for Scotland. Yet it transpired that due to Johnson’s mother being English, a gentleman’s agreement between the home nations tied him to England. I can find no evidence online but my memory insists that further confusion about Johnson’s eligibility was caused by him being raised by his Jamaican grandmother, and not realising who is true mother was. Maybe, maybe not. 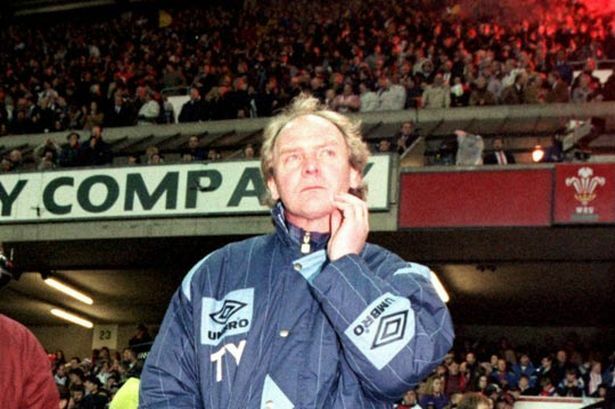 Then-Scotland manager Craig Brown went public in expressing his frustration at Johnson’s eligibility, in the eyes of FIFA, to play for Scotland (or any of the Home Nations) but which was deemed impossible due to the 1993 gentleman’s agreement. Still Johnson was restless for further international honours for whoever would have him. He was linked with Jamaica’s 2000 Gold Cup tournament squad and in 2004 was, according to Lawrie Sanchez, interested in playing for Northern Ireland but for red tape intervening once again. The goals had dried up by this point however and Johnson ended his career with just the five caps for Jamaica and England B. Thanks to @ShakeyMatchWorn for drawing Bristol-born Davies to my attention. Davies was playing for Newcastle United when he was included in Wales’ squad for the 1980 Home Championship. Mike England had just taken over as manager and had promised each member of the squad at least one game as he prepared for the 1982 World Cup qualifying campaign. 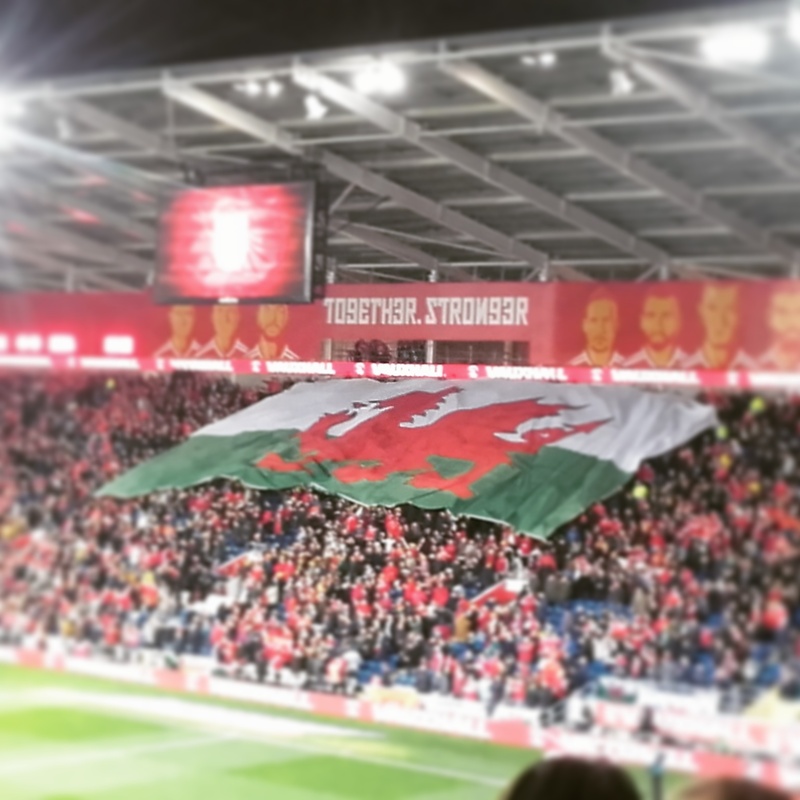 Famously, Wales got off to a great start by beating England 4-1 at The Racecourse and as the tournament progressed Wales went into the final match at home to Northern Ireland with a chance of winning the tournament for the first time outright in over 40 years. With Northern Ireland though chasing a first ever outright win since Ireland was partitioned, England went back on his word and selected a strong team including the likes of Brian Flynn, Terry Yorath and, in Davies’ left back position, Joey Jones. Davies, who won a single under 21 cap, had been allocated the number 6 shirt in the squad which misleadingly suggests that he made the starting XI during the Championship but he didn’t, and he ended up never doing so. A move to Manchester City was not a success and series of loan spells and transfers around the lower divisions saw Davies end up at Swansea City where, after only a handful of appearances, injury brought an end to his career.